We come to know that a powder made by elephant apple can control diabetes within 21 days. Is it true and how it works? Just for your information, I will mention that the elephant apple is also known as Bael Tree. However, I have to inform that the scientists have put the effectiveness of this herb on blood glucose control under question. A recent study has shown that this herb only stimulates the effect of metformin in rabbits, but it is not able to reduce the blood glucose concentration by itself. Yes, it is true that the rabbits’ metabolism is different from ours, but these are the results the scientists got. Besides, the exact mechanism of this stimulation is still unknown, so I’m not able to explain you exactly how this herb works. Although the side effects are still uncovered, sometimes, this is considered as green light for its safety of use. 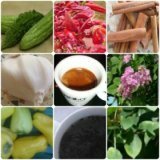 In addition, I want to inform you that there are several very effective herbs on the market, like cinnamon, gymnema sylvestre and bitter melon, which are proved for safety and effectiveness. A fact, which shows the effectiveness of those herbs, is that there are used during the early stages of diabetes type 2. However, during the advanced stages of diabetes, you have to use one of the herbs mentioned above along with diet, exercise and medications. Such combination will ensure you better blood glucose regulation. Besides this, most of those herbs are at the form of capsules, which makes their usage quite easier. The only thing, which you have to do, is to follow the directions on the box. Loguad produce Tormentic acid which increase insulin production and help to reduce diabetes.